Apex Legends, in case you somehow haven’t heard, is the recent slide-n-shoot battle royale hit from Titanfall devs Respawn – and it’s a pretty damn good game. And now that Season 1 has released, it looks set to be even damn good-er than before. Certainly enough for me to spend hundreds of hours in-game collating the below top Apex legends tips and tricks on how to become pretty damn good yourself. Our 100 Apex Legends tips are broken into four skill sections: beginner, intermediate, advanced, and expert. A lot of effort has been made to ensure there’s something for everyone here, even seasoned veterans. There are some really obscure tips and strategies in the advanced and expert sections, so if you’re confident that you know everything there is to know about Apelegs, I suggest you skip ahead, and prepare to be surprised! Our Apex Legends tips and tricks are filled with useful information for all skill levels; I guarantee that by the end of this page you’ll have learned at least one or two (and quite possibly ten or twenty) things you didn’t know before. Click on any of the links below to skip ahead to a particular section of Apex Legends tips. And if you scroll right to the bottom, you’ll find a list of all the other (50+) guides in our Apex Legends series. These tips are for those new to the game, and will cover some basic features and good-to-know aspects of Apex Legends. 1. Apex Legends is a last-man-standing online multiplayer shooter – you and every other player in your lobby drops onto the same map and must loot and fight until just one team is left standing. 2. For the time being, Apex Legends is a squads-only game; you can enter a game alone or with up to two friends in your team, but if there is space left in your squad of three then it will be populated with random players within your region. 3. There are up to 60 players in each match of Apex Legends (20 teams of 3). You can see the players left remaining in the match by looking at the indicator in the top-right of your screen. 4. Season 1 of Apex Legends began on 19th March, bringing with it a new Battle Pass, a brand new character (Octane), and lots more features that you can read all about in our Apex Legends Season 1 guide. 5. Each match is divided into 8 Rounds, during which the ever-contracting Ring pushes players closer together. Most games, however, will only last until the 2nd, 3rd, or 4th Round before just one team is left standing. For much more information on how the Ring and Rounds work, check out our Apex Legends Ring guide. 6. Apex Legends features a fantastic and intuitive Ping system, which allows you to communicate non-verbally with your team by “pinging” locations, objects, and enemies. Many players don’t realise just how much you can do with the Ping system; read more in our Apex Legends Ping/Communication guide. 7. At the beginning of each match you choose one of nine – soon to be ten – characters (you can’t choose the same character as one of your teammates). Each character has access to three unique abilities: a Passive (always in effect), a Tactical (activatable on a short cooldown) and an Ultimate (powerful activatable ability but requires charging over time). 8. 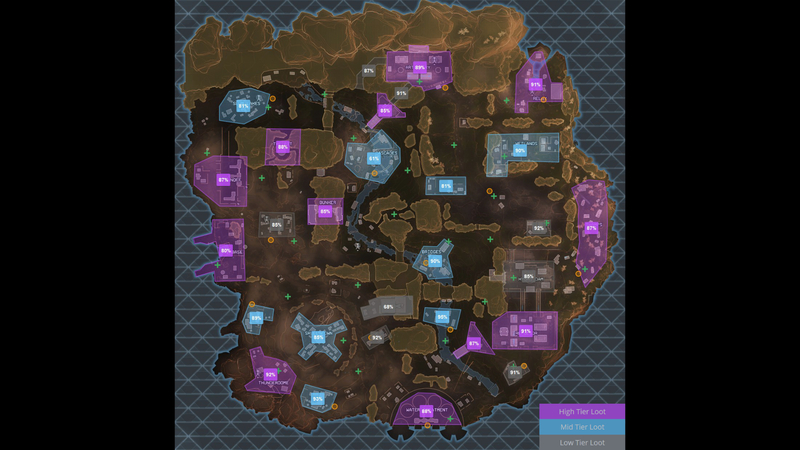 There is currently just one map in Apex Legends, called King’s Canyon, with 17 named locations and tonnes of other areas of note spread across it. It’s a smaller map than most battle royales have, and you can easily cross it over the course of a match. 9. Loot is randomised each match, with different locations sporting different tiers of loot (visible in the top-left of your screen when you enter a new area). These loot tiers are randomised, but each area does have a particular preference for certain tiers of loot. Read more in our Apex Legends map and locations guide. 10. King’s Canyon is covered in ziplines, both horizontal and vertical, which you can attach to and slide along to cover distances quickly. There are also hot air balloons which operate like vertical ziplines, but if you reach the top it will redeploy your rocket boots (just like when landing at the start of a match) to help cover great distances. 11. There’s absolutely no fall damage in Apex Legends, so you can feel free to jump as far as you like. BUT! You can still fall off the map (which kills you instantly), and landing after a long fall will result in a brief stun time while you recover. 12. There are 20 different guns in Apex Legends, all of which you can read about in our Apex Legends guns/weapons; but each gun is only as good as the attachments you find and equip it with. For more information on attachments, take a look at our Apex Legends attachments guide. 13. Headshots deal more damage than bodyshots. The multiplier is usually either 1.5x or 2x depending on the weapon you’re using. There are also “legshots”, which deal less damage than bodyshots. 14. You can melee in Apex Legends either by tapping your melee button or by left-clicking (attacking) while not holding a weapon. 15. If you are brought to zero health but you have teammates left standing, you will be “knocked”; you can crawl around, ping, and open/close doors but can’t otherwise act. You can revive knocked teammates before they bleed out by heading over to them and holding the Interact key. If they bleed out or are otherwise fully killed, you can grab their Banner from their death loot, and use it to respawn your lost teammate at one of the map’s many Respawn Beacons. For more details check out our in-depth Apex Legends reviving guide. 16. When you drop at the start of a match, one of you is the dedicated “Jumpmaster” who controls where all three of you land. You can disconnect from your Jumpmaster at any time by holding “CTRL”; and you can always pass on the Jumpmaster role to someone else before you drop if you want. 17. Apex Legends is all about mobility. Not only can you sprint, jump, and crouch, but you can also slide and climb walls and other obstacles. It’s heavily advised that you slide as often as possible, as it is often faster than sprinting and makes you a smaller target. Take a look at our Apex Legends basic movement guide for tonnes more information. 18. You can holster your weapon to run faster and climb higher than you can with a gun in your hands. 19. Apex Legends is all about teamwork. You are against whole other squads, and you’re likely to die quickly if they find you alone. Stick together, and focus on learning to move and fight as a team. 20. All characters have the same health pool of 100 Health; but you can equip Body Shields in order to give yourself Shields in increments of 25, up to a maximum of 100 Shields (200 effective health). 21. You can use a variety of different healing items and consumables to rapidly regain lost Health and/or Shields. It’s good to learn the benefits and drawbacks of different kinds of healing items – check out our Apex Legends healing items guide for further info. 22. Some types of equipment (Body Shields, Helmets, Knockdown Shields, and Backpacks) are called Gear, and can be found in various rarities (from worst to best: white, blue, purple, gold). The same is true of weapon attachments. The higher the rarity, the better the benefits of that item. Check out all the benefits of Gear and how Helmets and Body Shields work with our Apex Legends Armor and Gear guide. 23. Backpacks expand the size of your inventory. It’s important to make sure everyone in your team is equipped with a white Backpack at the very least as soon as possible. 24. Gold items have unique benefits. For example, Gold Knockdown Shields allow you to self-revive; and Gold Sights have the ability to highlight enemies through smoke. Check out all the benefits in our Armor/Gear guide linked above. 25. You may only hold two weapons at a time. When swapping weapons, the game will swap out whatever weapon you’re currently (or were last) holding for the new weapon. Our intermediate tips are for those who know how Apex Legends works and have put in a fair few hours but want to know how to get to the next level when it comes to fighting and moving about King’s Canyon. 26. All the characters in Apex Legends have different sized hitboxes, which means some are more easy to hit than others. Wraith and Lifeline have the smallest (best) hitboxes, while Gibraltar and Caustic have the largest (worst). However, since the 1.1.1 Patch Notes (which you can read about on our Apex Legends update page), Gibraltar and Caustic have an additional Passive ability, called “Fortified”, which reduces their damage taken by 10% to compensate for their larger hitboxes. 27. While you are looting, you are vulnerable, because you aren’t looking around for nearby threats. Looting should be done as quickly as possible; teach yourself never to spend more than a couple of seconds at most with each piece of loot or death box. 28. Gold Gear is no better in terms of stats than Purple Gear. A Gold Body Shield gives 100 Shields just like a Purple Body Shield. The only difference lies with the unique extra benefit each piece of Gold Gear bestows. 29. Knockdown Shields can be activated while knocked down to protect the area directly in front of you. Different tiers of Knockdown Shield take different amounts of damage before breaking. Meleeing or Executing a downed enemy will ignore their Knockdown Shield. 30. Jump-sliding is generally the fastest way to move in Apex Legends. To jump-slide, simply sprint to build momentum, then slide, and jump at the end before you start to slow down. Rinse, repeat. Check out our Apex Legends basic movement guide for further details. 31. All characters move at exactly the same speed. They only appear to move at different speeds because of the speed of their arm animations. 32. You can use hot air balloons to land on one of the very tall cliffs or rocks across the map (or land there at the start of a match); but you can’t stay there long. A countdown will start telling you that you are too high up and need to get down. However, it gives you a good 20 seconds or so to look around and possibly get an advantage in fights. 33. The key to success in Apex Legends is to always stay on the move. Never ever stay still, both in a micro and macro sense. If you’ve finished with one area, head to the next. If you’re looting something, moving from side to side as you do it in case an enemy is aiming at you. 34. Use contextual Pings on a variety of different objects. Pinging a weapon or piece of equipment will tell your teammates what it is you’ve found. You can also ping enemies, supply bins, supply ships, ziplines, and much more. Check out our Apex Legends Ping/Communication guide for the full list of possibilities. 35. The top-performing weapons right now are (in no order) the Wingman Pistol, the Peacekeeper, the R-301 Carbine, the R-99, and the M600 Spitfire. Use the above chart as a guide if you’re still getting a handle on weapon rankings and preferences. 36. Listen out for footsteps, gunfire, and any other audio prompts that indicate nearby enemies. A good pair of headphones WILL help you with this. 37. Generally, Apex Legends is a close-quarters game. Think twice before taking that long-range shot with the Longbow, because even if you hit they’ll likely just heal up. Wait before you’re near enough to cause real damage. This is something even more seasoned players have difficulty with. 38. Make sure you’ve turned on the damage figures in the Settings menu. These numbers are colour-coded to indicate the Body Shield of the enemy. They will also light up gold for a headshot, and you’ll also hear audio indicators when you headshot or when you break through the enemy’s Body Shield; so keep your eyes and ears peeled. 39. There is bullet drop and aim drift in Apex Legends, but none of the guns are hitscan or have damage drop-off (except with the Havoc’s single-shot mode, which features both). Read more about all this at the top of our Apex Legends guns/weapons guide. 40. Hop Ups are unique attachments which only fit onto specific guns. They often bestow very significant benefits upon that gun, such as a full-auto mode for the Prowler Burst SMG, or a tighter spread for the Peacekeeper Shotgun. 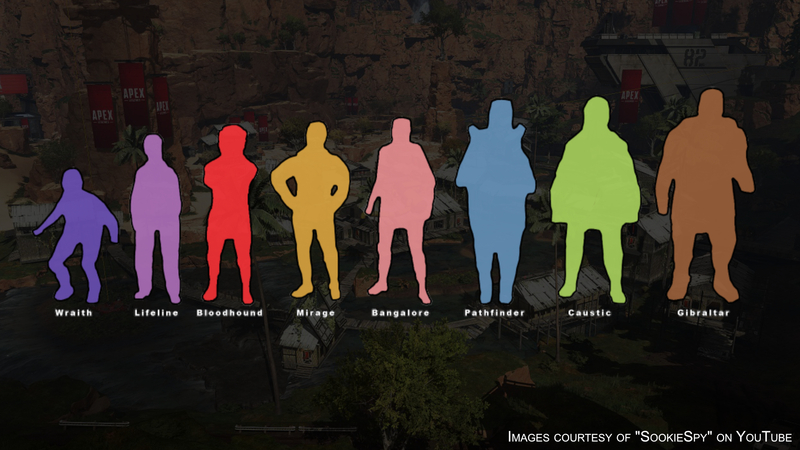 Read more about them all in our Apex Legends attachments guide. 41. The advantage in Apex Legends generally goes to the aggressor – to whoever notices the other team first and initiates the fight. Third-partying (entering into a fight between two other teams while both are distracted) is also extremely effective. If you find yourself in a tough spot, focus on repositioning and healing. Don’t commit to a fight you can’t win. 42. Perform a finisher to execute a knocked enemy by moving up to them and hitting your Interact key; however this prompts a length animation which you can’t back out of, making you very vulnerable. As a general rule, don’t bother with these except in rare cases, which you can read about in our Apex Legends finishers/executions guide. 43. Inventory management is an important skill to learn in Apex Legends. Carry only what you need, and learn how much ammo you need for different guns. Don’t carry more than one stack of Shotgun Shells for a Peacekeeper, for example. 44. While in your inventory, you can see the Gear (Body Shield, Helmet, Backpack, Knockdown Shield) of your teammates next to their names in the bottom-left corner of your screen. 45. Attachments will auto-attach onto viable guns when you pick them up. This is very useful in most circumstances, but if for any reason you don’t want it to auto-attach, then simply use your Alternate Interact key (set the keybind for this in the Settings menu). 46. You can block doors from opening by standing in front of them. However, they can still be destroyed with two melees, or using explosives. You can also shoot the handle of a door with a Heavy Ammo weapon to open it from afar. 47. While you should stick with your Jumpmaster for the most part while landing (so you’re not too split apart), you should detach from them just before you land so you can all head to different buildings and areas nearby to loot up more quickly. 48. If you ping something and then hover over it, then the UI will tell you how many metres away you are from that point. This is particularly useful when landing at the beginning of a match. 49. If you’re right over the top of a landing location, you should just drop straight down; but if the location is further away, then you should use the wave-drop technique. Learn how to do this to perfect your landings with our Apex Legends landing guide. 50. Supply Bins each contain three pieces of loot, and they always appear in exactly the same locations every match; however other forms of loot, such as floor loot and Loot Ticks, are random. The same is true for the Hot Zone and the Supply Ships, which differ in location each match. Check out our dedicated Apex Legends loot guide to learn more about all this. This is where things start to get more specific and obscure. Our advanced tips will cover everything from particular ability uses to advanced movement tips. 51. Jumping just as you go over an Octane Launch Pad will cause you to go even higher and further than normal when bouncing. 52. If you find Ultimate Accelerants, they should always, ALWAYS go to the Lifeline on your team, because Lifeline’s Ultimate is the slowest ability in Apex Legends, and provides the most consistent benefit to your team over the course of a match. 53. Fight around the edges of Bangalore‘s Smoke and Gibraltar‘s Dome rather than right in the middle, so that you can duck in and out whenever you need to fight/recover. 54. Learn how to “A/D spam” effectively (dancing around during a fight and not standing still). If you’re moving slowly or predictably then you’re an easy target. Take this into account when doing target practice; learn to shoot effectively while dancing. 55. You can Bunny Hop by jumping repeatedly while sliding (jump every time you hit the floor). This is not as fast as sprinting, but best used while healing because it makes you a much smaller and faster target to hit while you heal. For more information on how to Bunny Hop, check out our Apex Legends advanced movement guide. 56. During (or just after) a fight, it’s much more efficient to swap out your Body Shield for a less damaged one (from death loot, for example) rather than healing up. Saves you time and also saves those healing items for when you truly need them. 57. Helmets reduce TOTAL headshot damage, NOT bonus headshot damage. I know, we’ve all heard that it’s the other way round, but it’s not true. They reduce total damage by 10%/20%/25%. Don’t believe me? Check out our Apex Legends Armor and Gear guide. Click on the above image to view it at highest resolution. 58. The loot tier of a location is NOT fixed, and can change from match to match. It’s amazing how few people know this, and how many disbelieve it. While particular locations may have a much higher chance of being a specific tier, they can occasionally change. Check out our Apex Legends map and locations guide for more info. 59. Use contextual Pings in your inventory in order to request a specific type of ammo or attachment. You can also use it while in your Healing Menu to request a certain type of healing item. Check out our Apex Legends Ping/Communication guide for full details. 60. Not all finishers take exactly the same amount of time. All last somewhere between 4 and 6 seconds, with Pathfinder‘s “Hi-5” taking the shortest time. 61. As long as someone in your team has your teammate’s Banner, either of you can respawn them at a Respawn Beacon – it doesn’t need to be the one who picked it up. 62. The time it takes you to bleed out is 90 seconds at first, but decreases to 60 seconds the second time you are knocked. Respawning at a Respawn Beacon resets this. 63. The Gold Backpack’s healing time reduction effect, contrary to popular opinion, DOES NOT stack with Lifeline‘s Passive ability. Only the 50% reduction of the Backpack is taken into account. 64. Tactical reloads (reloading while there is still ammo in your magazine) is, for most weapons, faster than full reloads (reloading when your magazine is empty). 65. You can squish yourself by standing atop Supply Bins as they open, if there is nowhere for you to be pushed to. This is also the case sometimes for Supply Drops and Lifeline‘s Care Package; both can squish you (not knocked but straight dead) if you are under them as they land. 66. Switching weapons is quicker than reloading, which means it’s nearly always better in close-quarters combat to switch to your other weapon to continue dealing damage rather than reloading. For tonnes of tips on the best loadouts and weapon combos in the game, have a read of our Apex Legends loadout guide. 67. Jumping off the zipline of a Hot Air Balloon before you’re at the top won’t proc the rocket boots redeploy. You need to let the game throw you off the very top in order for this to activate. 68. Bangalore‘s Passive movement speed buff procs if bullets are fired near you; you don’t have to be damaged for it to activate. This makes her very powerful at closing gaps during long-range encounters. 69. Use Pathfinder‘s Grappling Hook to swing and cover large distances very quickly by looking to the side and moving/strafing as you swing. 70. Neither Mirage‘s Passive/Ultimate nor Wraith‘s Tactical ability renders you fully invisible when you use them. Mirage becomes an outline, while Wraith leaves behind blue trails which are fairly easy to follow. So don’t rely on enemies losing sight of you when you use these abilities. 71. You often have time to heal even in hectic situations; all you need is a few seconds, and you can move about as you heal to give yourself even more time and safety. A single heal is sometimes all it takes to win a fight. 72. As of the Season 1 update, Pathfinder can grapple onto ziplines. Read more about this and all other ability changes in our Apex Legends update guide. 73. Each gun has a specific spray pattern that can be learnt and adapted to (use Training Mode to help with this). 74. The range markers on long-range scopes are always accurate, UNLESS you have changed your Field of View in your Settings menu to anything other than 90. So if your range markers are telling you porkies, that’s the reason. 75. Out of game, you can add command line arguments to Apex Legends to do certain things (for example, “-novid” stops the EA and Respawn intro videos from playing when you load up the game, and “+cl_showfps 4” displays your FPS and Frame MS during games). We’ve packed our expert tips with all manner of advanced, complex, and obscure tips, on everything from exploitable glitches and bugs to strategies on finishing fights before they’ve even begun. 76. Octane‘s Tactical ability, Stim, will never take him below 1 Health, so you cannot die simply by using Stim. 77. You can block doors with Wraith‘s portals so it’s difficult for others to enter/exit. But you can still pass through using your Tactical ability. 78. You can place Gibraltar‘s Dome of Protection atop Lifeline‘s Drone, then push the drone along to move the Dome as well. 79. Wraith portals last 60 seconds, but there’s no indication of this timer. The solution? Check your Ultimate charge level. At 39%, your portals will disappear. 80. Double-pump (fire much quicker) with the Peacekeeper by reloading, then immediately switching weapons and switching back to interrupt the reload. Check out the video above for a demonstration of this. 81. Hip fire with shotguns. Don’t bother aiming down sights unless you’re at longer ranges (and, generally, don’t use shotguns at longer ranges anyway). Aiming down sights takes time, and it doesn’t provide much benefit at all for shotguns. 82. Just before landing at the beginning of a match, level out so that you’re travelling as horizontally as possible, then slide at the end. You’ll gain a massive speed boost which is great for crossing that extra bit of distance quickly. 83. Thermite Grenades are a Caustic‘s best friend. The Thermite damage over time stacks with the damage over time of your Nox Gas. 84. Bind your shoot key to Mouse Wheel Up (using the second hotkey option), then use it with the Hemlok to turn its single-shot mode into full-auto without the need to mash left-click. 85. If you’re having trouble Bunny Hopping, the problem is usually because you’re forgetting to keep Crouch held down. But if that’s not the problem, you can bind Mouse Wheel Down to jump in order to make Bunny Hops easier. 86. If you slide as you activate your Mirage Tactical, then your decoy will also slide, making them more realistic and possibly fooling enemies for longer. 87. You should always jump-kick (jump and melee together) rather than regular meleeing, as the cooldown is faster and you can chain more melees together in the same space of time. 88. You can slide backwards as quickly as you can slide forwards, allowing you to quickly retreat without taking your eyes off the enemy. 89. The benefits of crouching as you switch weapons (which interrupted your weapon switching animation and allowed you to swtich/shoot significantly faster) is no longer part of the game as of the Season 1 update. So don’t try it, you’ll just look silly now. 90. Bloodhound‘s Tactical (Eye of the Allfather) is directional; it does not operate in a sphere all around you, but in a cone where you’re looking. So make sure you’re looking in the right direction when you use it. 91. Bangalore‘s Ultimate and Gibraltar‘s Ultimate are quite similar, but Bangalore’s is better for zoning and defence (because it covers a much larger area) while Gibraltar’s is much better for offense (because it detonates much more quickly). 92. The pre-Season 1 nerf to the Wingman means you’re now better suited ADSing rather than hip-firing with it, whereas before it was better to hip-fire due to the extreme accuracy and the fact that ADSing takes a little extra time. 93. The Precision Choke Hop Up attachment for the Peacekeeper and Triple Take will remember the tightened spread for a short while even after you stop aiming down sights, giving you a small window where you can move faster while still having the tremendous accuracy of the Choke. 94. There are a handful of automatic weapons which don’t have the barrel stabilizer attachment (which reduces recoil), which means the spray patterns for these guns will always be the same. Take advantage of this to learn them perfectly (the guns are the VK-47 Flatline, Havoc, and Prowler). 95. If you activate Bloodhound‘s Ultimate while on a zipline, there is no wind-up animation before the Ultimate takes effect; instead, you transform instantly. 96. If you time your melee just right as you land after a long drop, you will completely negate the “fall-stun” effect, and can continue moving without any recovery time. 97. Caustic‘s traps can be shot at the base to destroy them without setting off the gas. 98. You can climb atop doors in order to climb even further, allowing you to access hard-to-reach places. Many know this trick for smaller doors, but it’s also true for larger doors such as those found in Artillery, Market and Repulsor. Close the door, climb atop it, then look down and open the door, and then climb up to the top of the building. 99. Coordinate kicking in doors with your teammate. Many players have learnt that it takes two melees to destroy a door, so coordinating like this will allow you to get the drop on unsuspecting enemies. 100. This is my favourite tip of all, because it’s so obscure but so useful. You know how there are no attachments in Training Mode? Well that’s not quite true! There is a way that you can practice firing guns with attachments. Check out our Apex Legends Training Mode guide for full details. You’ve reached the end of our 100 tips and tricks! Hopefully you’ve learnt one or two new things that you can take into battle next time you drop down into King’s Canyon. But that’s not the extent of our knowledge! We have over 50 focused guides on everything from guns and attachments to characters and abilities, from locations and the Ring to unlocking heirlooms and finishers. Take a look below for our full list of Apex Legends guides – all up to date as of the 1.1.1 update!